The Frugal Family Life: $.55/1 Joy Ice Cream Cones = $.64 at Walmart! 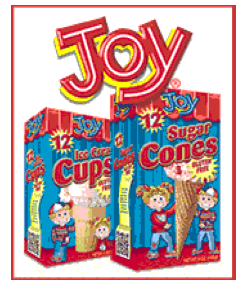 It looks like this popular Joy Ice Cream cones coupon is back! Just enter your email address to print a rare coupon valid for $0.55/1 any Package of Joy Gluten Free Ice Cream Cones or any Other Package of Joy Ice Cream Cones!